Love is in the air, and on the wrist, the ears, the neck… Rubies and pink sapphires are, despite the different names, actually the same mineral! Corundum is an extremely hard mineral—almost as hard as diamond on the Mohs scale—and the difference between a ruby and any color sapphire is simply the variety of impurity that happens to permeate the crystal. Though there is no universally recognized line between rubies and pink sapphires, the true, deep red of a ruby is much more valuable than the less rare (but equally beautiful) range of tones seen in pink sapphires. Renowned in the world of precious colored stones for the astonishing carat weights of its larger pieces, Bayco Gem Corp. also offers a less intimidating Prê t-à -Porter collection for a simpler, more understated look. These infinity-inspired rings are as impressive as they are beguiling, set as they are with 9.75 carats of rubies and 8.46 carats of diamonds (for the platinum ruby ring), or 12.28 carats of pink sapphires and 8.26 carats of diamonds (for the platinum and 18-karat pink gold sapphire ring). 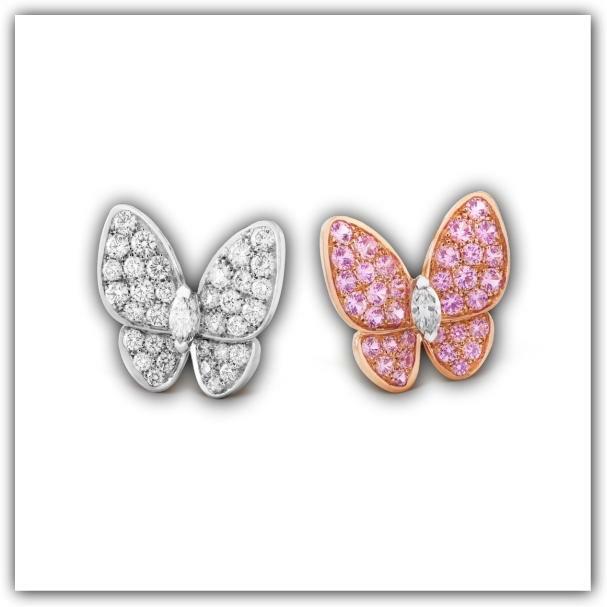 With these Two Butterfly earrings, Van Cleef & Arpels uses color asymmetrically to depict two charming creatures that are the same, but different… kind of like you and your own main butterfly, perhaps! The white insect is set with 36 diamonds, totaling 0.99 carat, and its pink mate bears 34 stones, totaling 0.88 carat. Did you know that the flamingo is pink only because of their preferred diet of brine shrimp? 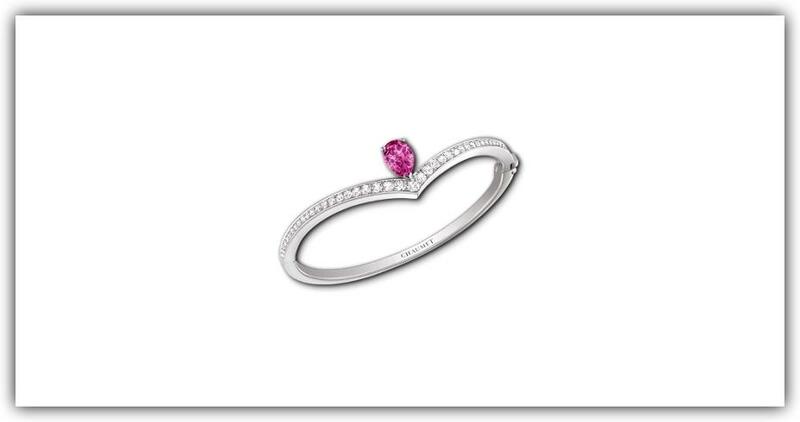 Distract your Valentine with fun facts as you prepare to unveil this pink sapphire flamingo ring, which is pink because of the traces of chromium that have infiltrated the corundum mineral (another fun fact to share with her). 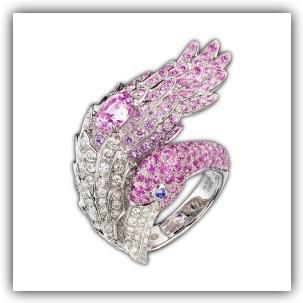 This precious fowl wraps around the finger, an oval-cut pink sapphire (1.25 carats) nestling among the white gold feathers pavé -set with round-cut pink sapphires. Round-cut white diamonds also show up, perhaps as a subtle nod to what a flamingo would look like without its tasty brine shrimp, and two purple sapphire cabochons act as eyes. Chaumet ’s Joséphine “Aigrette” bracelet belongs to the Empress of your heart. Named for Napoleon’s love, a style icon in her own right, the José phine collection draws from the jewelry and fashion codes of the early 19th century to create something profoundly contemporary. The “aigrette” was originally a white egret’s feather, precious enough as a headdress ornament when it was merely adorned with gemstones. Later, this decoration was recreated in diamonds for the truly chic. Chaumet’s white gold bracelet pares down the headdress to its essentials: a curved line of brilliant-cut diamonds, topped by a pear-shaped pink sapphire of 2 carats or more.